Blackbirds are often the first birds to appear in the morning. They come into the garden singly or in pairs, & they have a presence about them. 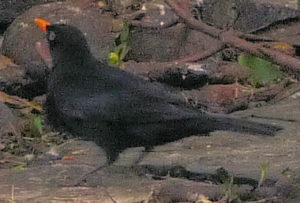 The male is a dramatic black with orange beak & eye ring; the female is more subtly coloured, speckled with browns & blacks. They are members of the Thrush family. Their melodic song can be heard in the dawn chorus, & often through the night. 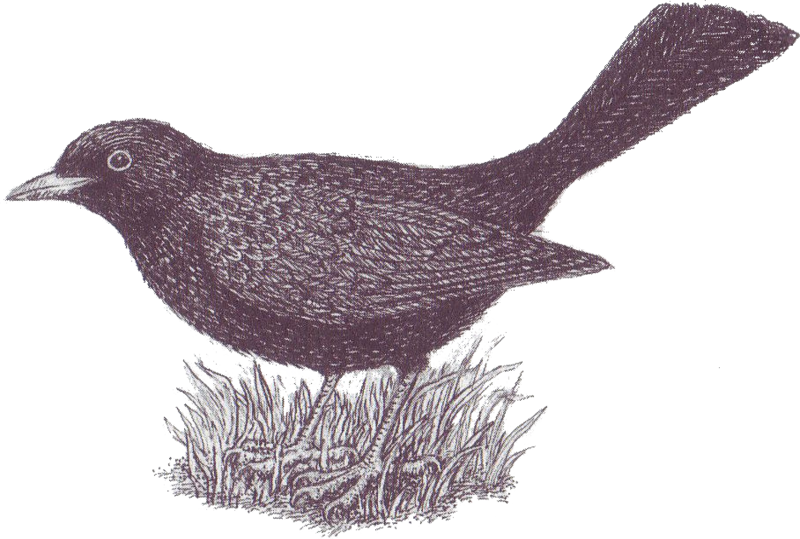 A Blackbird will swoop in & come to a sudden stop, head & tail held high, going from flight to instantaneous suspended animation. Its unblinking eyes seem to look straight through you, fixing you with its stare. Is it reading your mind? Are you friend or foe? ‘The Blackbird has long been associated with the ‘Otherworld’. Believed to sing its loudest during the twilight period between day and night, the link is not surprising. Another time the Blackbird sings loudly is following a heavy downpour, earning it its other name of ‘Stormcock’. 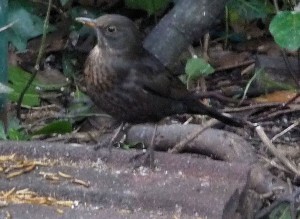 Blackbirds trawl through leaf litter & ground cover for slugs, snails, worms, insects – any protein. They will take advantage of dried mealworms & suet nibbles sprinkled on a stack of roof tiles by the birdbath. And, as our video clip below shows, they will visit a suitable birdfeeder when mealworms & suet pellets are on offer. 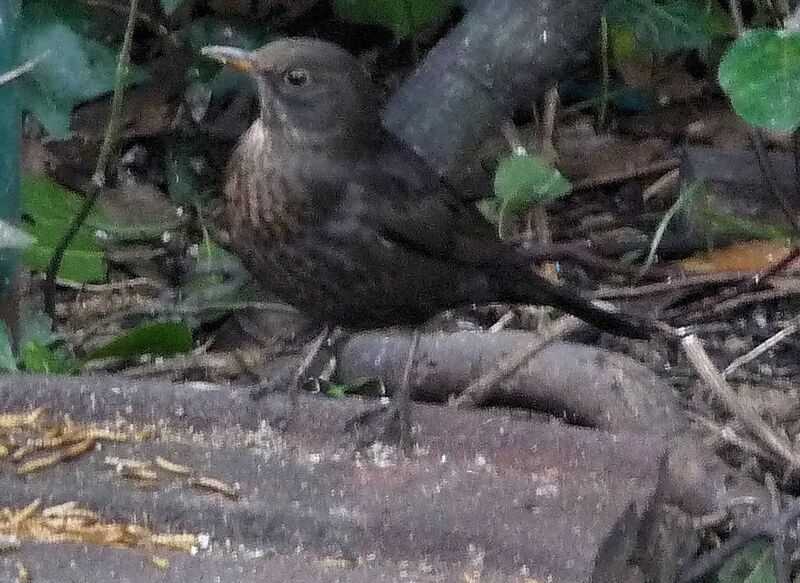 An empty snail shell on a tile or stone could be a clue to a Blackbird meal: the shell is held in the beak and thrashed against the ‘anvil’ to dislodge the mollusc. 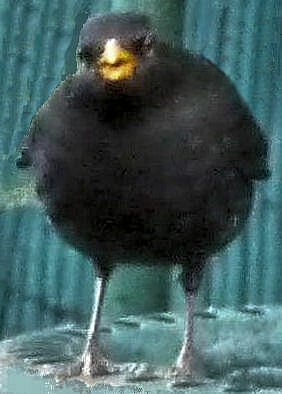 Blackbirds battle in springtime across a number of back gardens. The prize is a nesting spot in an Elder tree & access to a number of gardens, including ours, to feed. Nests, eggs & chicks are guarded with a relentless, piercing alarm call… A ‘pink-pink-pink’ that can go on for 20 minutes… When you look out to see the cause of it all, there may be a cat quite close to the nest, & Blackbird parent(s) diving, flapping, & hovering over it & making that annoying noise until the cat gives up & slinks away. 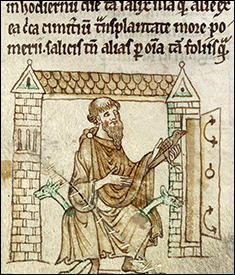 “The holy Kevin, while avoiding the society of his fellow men during the season of Lent, as his custom was, devoted his time to reading and prayers, in the desert, occupying a small hut which did nothing but keep out the sun and rain, giving himself up to contemplation only. And while he was lifting his hand to heaven through the window, as he used to do, a blackbird by chance alighted on it and, treating it as a nest laid an egg there. And the Saint showed such compassion towards it, out of his patient and loving heart, that he neither closed his hand nor withdrew it, but indefatigably held it out and adapted it for the purpose until the young one was fully hatched.